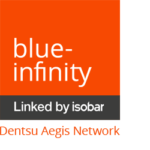 blue-infinity Linked by Isobar believes in ideas without limits. Our digital expertise is backed by robust systems and platforms, and is underpinned by the power and scale of Dentsu Aegis Network, through 50,000 experts in 145 countries who innovate the way brands are built. With over 1’000 multi-cloud Salesforce experts alongside our digital teams, we are helping brands acquire, convert, retain and serve customers across multiple channels. As digital technology continues to transform businesses and brands, what we can do has no boundaries. We take up new challenges with an open mind about the structure, team, technology and creative solution necessary to deliver the best possible outcome for clients.